There’s no doubt about it, small computers are very in right now. As technology continues to develop, hardware manufacturers are focusing thier R&D efforts on how to get more powerful components in smaller cases. Because of small form factor components like mini-ITX motherboards and M.2 SSDs, small-form PCs can have power levels rivaling large frame PCs. They’re popular for media center setups, or for users who might need to move their equipment frequently. 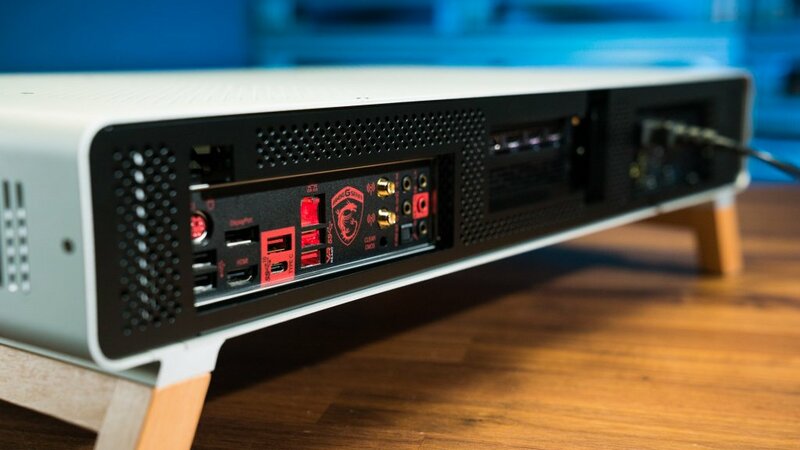 The space-saving keystone is the mini-ITX motherboard, which typically has a single PCIe x16 slot, two RAM slots and the typical array of peripheral I/O connections. They also often use standard CPU socket types, though other options do exist. Of course, to get the most out of a mini-ITX setup, you’ll want to install it in a smaller case that will accommodate it. There are plenty of case styles on the market, and they vary stylistically. Ultimately though, most of these smaller cases sit in your workspace in the same old way, usually next to the monitor or on the floor. 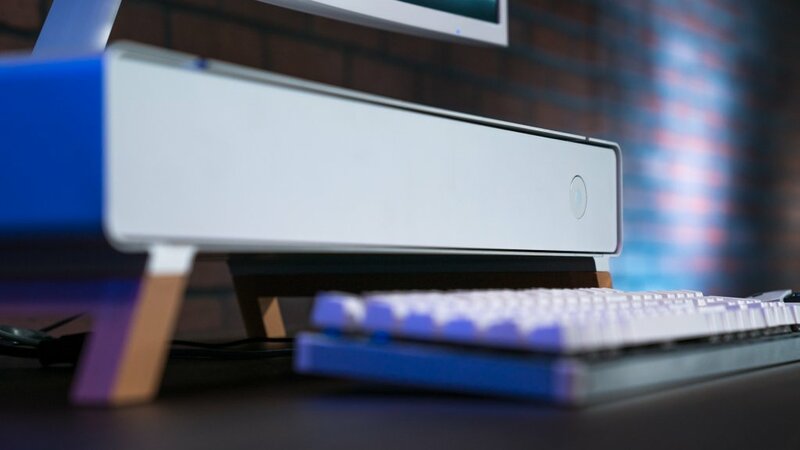 The Cryorig Taku case saves on desktop real estate in a novel way: by bringing the case to the front and center of the workstation and elevating it a few inches on a set of wooden legs. The advantage here is that the build has a significantly smaller footprint. 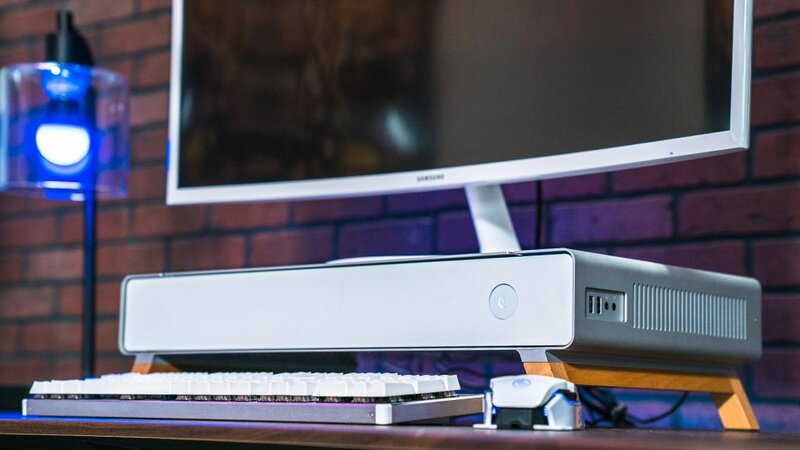 The Taku doubles as a monitor stand, and the legs offer enough space to slide the mouse and keyboard under when not in use, neatly clearing your surface for other activities. It’s a unique concept, and it turned out to be surprisingly practical. It’s nice to see form and function come together so nicely. As of article publication, you can pick up the Cryorig Taku chassis on Newegg for $300. From a design perspective, the Taku is gorgeous. It has a minimalistic aesthetic that lets it blend in or stand out, depending on what’s nearby. Most of the body is made of aluminum, which lends it a neutral, light-grey appearance. 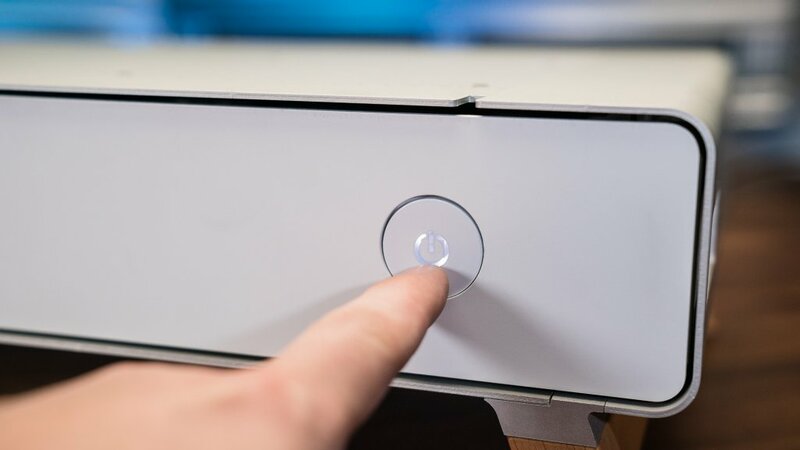 The front plate is thick white plastic that’s almost seamless other than the single large power button that lights up bright white when the system is on. There’s a small cutout on the right side (if the front panel is facing the viewer) with the front panel I/O consisting of two USB 3.0 ports and mic & headset audio jacks. 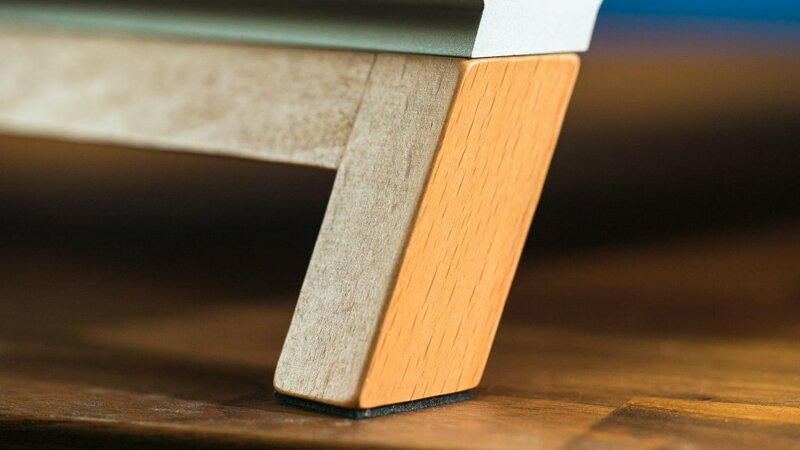 If you’re into mixing wood and metal, you’ll appreciate the wooden legs. 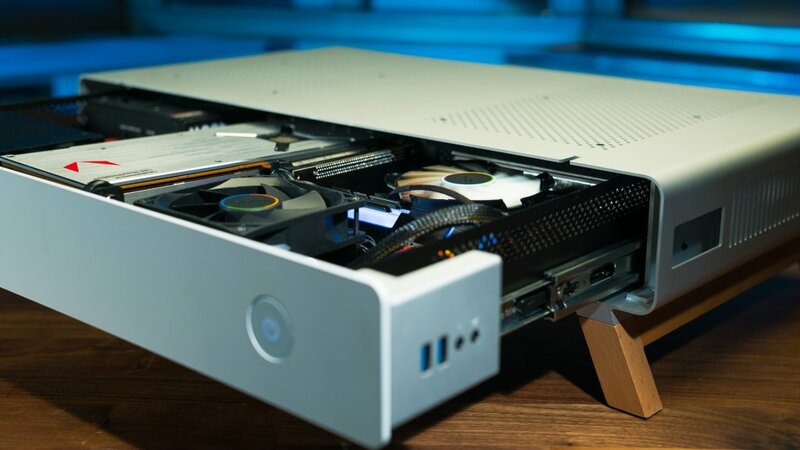 I would prefer if Cryorig had opted to go with a set of either aluminum or white plastic legs that match the rest of the case, but that’s entirely dependant on personal taste. The legs are definitely sturdy enough to get the job done. Each set of legs screws to the bottom of the case, and there’s no wiggle or play once all the mounting hardware is attached tightly. The legs are rated to hold 15Kg, or about 33 pounds, which seems sufficient for pretty much any modern flatscreen monitor. Just don’t be that guy who thinks they can stick their twenty-year-old CRT up there. If you do, you’re going to have a bad time. Lightly pressing the front plate reveals the internal system drawer with a satisfying click (this is where components are installed), which can slide out part-way, and is finished in an attractive black. Once you have all the parts installed, this is a great way to showcase the flashy RGB components used in your build. We do not recommend using this drawer to store gaming snacks, and take no responsibility should you choose to do so. The Taku really stands out for seamlessly weaving and function together into one concept. Many of its aesthetic features are necessitated by its focus compactness, though Cryorig gets major points for executing these design decisions in such an appealing way. We wanted to see how powerful of a system we could pack into this little case. After all, it’s small and it looks nice, but if you can’t fit decent components inside, you might as well just get a gaming console. Building in the Taku is easier than you might think given its limited clearances. The internal system tray can be removed completely by pressing in on a plastic tab in each slide-rail. Once it’s out, actually installing all the internals is a breeze. The tray is pretty shallow, which makes reaching in to fiddle with parts and connections a breeze. As I mentioned before, the base of the build is a mini-ITX motherboard. It’s the only board form factor the Taku supports, and typically the one used in used in small-scale builds like this. This is one of the few parts in this build that is constrained by how tight space is in this case. It’s not that mini-ITX is by any means a bad form factor, but the physical restraint imposed by its size means it has less PCIe and RAM slots than a full ATX board, so it’s important to make efficient use of what is available. For this build, we went with an MSI Z270I Pro Carbon AC board, which we chose due to its excellent use of available space. The main feature we took advantage of here is the motherboard’s storage connection options; specifically the M.2 slot. This isn’t a standard feature of mini-ITX boards, as they don’t really have enough space on the topside to accommodate an M.2 2280 (or longer) SSD. MSI gets around the issue by putting the M.2 slot on the underside of the board, which is a strategy that’s increasingly common. There’s enough space provided by the standoffs for it to just barely fit, and since the chipset and processor are both standard 7th generation Intel components, there’s already the micro architecture in place to support the PCIe lanes used by an NVMe drive. It’s really just a matter of engineering the physical PCB to accommodate a slot in an unusual position. 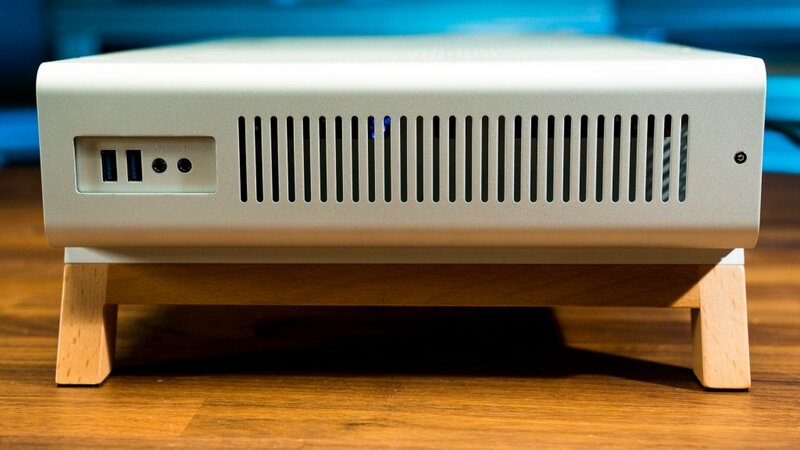 The Taku’s internal system tray does have a built-in housing for 2.5” drives, complete with its own cooling fan. We chose to go with an M.2 for the speed advantage, and also because we wanted cables and airflow to go through the SSD housing area to help with temperatures. We made the most of the motherboard’s two RAM slots by fitting in two 8GB sticks of TridentZ RGB DDR4-3200 RAM, for a total of 16GB. It’s really important to make the most of those two slots, so it’s worth it to get a pair of sticks with the highest capacity and fastest clockspeed you can fit into your budget. This RAM also lights up and has full RGB support, and the light shining out of the air holes in the top of the case looks really nice in a dark room. You’ll also be happy to know that you can still fit big, chunky graphics cards into this case. Cryorig says the case supports cards up to 11”, which means we could fit an AMD Radeon Vega 64 GPU into our build. We tried an EVGA GTX 1080 Ti earlier, (which did infact fit) but we decided that the brushed-metal Vega 64 matched the Taku’s aesthetic a little better. You might have noticed in the pictures that the GPU is lying flat next to the motherboard. Luckily, the Taku comes bundled with a 90° PCIe extender, as well as another very straight, short extender. This ended up being the hardest part of the build, because the extenders don’t support the weight of a GPU as well as we would like. Make sure you have the PCI slot screws ready to go as soon as the edge pins clicks into the bus. Still, it’s worth the effort, and I’m glad Cryorig went this route instead of forcing users to go with a half-form GPU or integrated graphics. Having a full size GPU in such a small case is an achievement we appreciate. For the CPU, we went with an Intel i7-7700K at 4.2Ghz. There’s no way we’d try overclocking it, as there really isn’t any space for any kind of closed water cooling loop. However, we did want to make sure we had the best air-cooled thermals we could get our hands on, and Cryorig was nice enough to also hook us up with a their new copper heatsink version of the C7 low profile cooler. The copper does clash with the the rest of the metals in the build, but it’s a worthy sacrifice, especially since copper has an extremely high thermal conductivity rating. The last piece of the puzzle for the build was the power supply, and that’s another component that’s heavily limited by the size of the case. The Taku can only accommodate an SFX PSU, as opposed to the more common ATX standard. SFX units tend to be a little squatter and more compact, and have a different screw configuration. Thermaltake saved the day by loaning us one of their 450W Toughpower SFX 80 Gold PSUs. This little guy still delivers a ton of power, despite the tiny package. It’s fully modular, so we were able to cut down on excess cabling, which saves space and improves airflow in the tight Taku chassis. 450W doesn’t seem like a ton, but it was more than enough to supply all of the components in this build. The PSU ended up being the lynchpin of the whole setup, and I’d highly recommend this killer PSU to save space in any SFF build. Everything came together beautifully in the end, and we got a high-performance PC in a fraction of the space of a typical gaming case. I’d wager our little Taku build could handle any game on the market today, or light media production, and look damn good doing it. So we’ve shown that the Taku is a great little platform to pack full of some real firepower, but who’s the target demographic here? My first thought was college students, who have tiny little desks in tiny little dorm rooms. Because the Taku provides space to tuck away peripherals, it’s great to have when you need to clear a little more desk real estate. 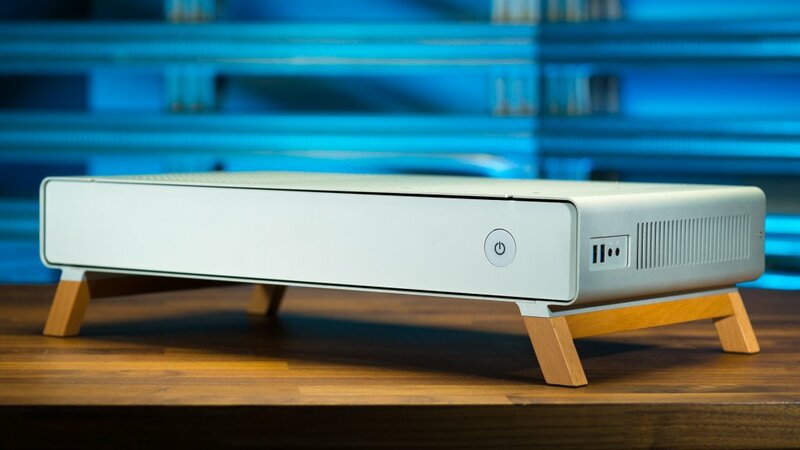 It’s also attractive enough to go anywhere in your home, which makes it a real contender for a media center PC. Just tuck it away on a shelf in your living room and you’re good to go. Really anyone who needs a jumping-off point for a stylish, compact performance computer should give the Cryorig Taku a look. There’s no reason you can’t have style and high performance. The Cryorig Taku chassis proves that.